Local chef educator Timothy Witcher won $10,000 on the reality television show "Chopped," in his second attempt. In 2015, the first time Chef Timothy Witcher appeared on the Food Network cooking show “Chopped,” he got, well, chopped. Not bad for the Pine Hill, South Jersey resident, but disappointment enough for a guy who grew up watching cooking shows instead of cartoons. His best friend since high school in Burlington County, top Philadelphia Chef Kevin Sbraga, had in 2010 already won “Top Chef” on the Bravo network. That friendship opened the door for Witcher, 36, to appear on his first reality TV cooking show. A TV producer he met while in New York with Sbraga taping a follow-up show asked Witcher, who’d applied to “Chopped” without any luck, to send him an email and apply again. Witcher ended up winning on Food Network’s lesser-known show “Rewrapped” in 2014, where he and two other chefs had to use Tastykakes as a foundation for their snack dish. But that’s not quite the same as “Chopped,” where the higher-profile contest is about tight timing and using curveball ingredients revealed at the last moment. “My dream was to be on TV, cooking,” he said, mentioning his YouTube channel, Jersey Chef, where he plays up in-season Jersey ingredients. So the aptly named episode of “Chopped” titled “Ready for Redemption” offered just that for Witcher. The episode aired this week and will repeat several times. This time out he won the top spot. Witcher took home $10,000, immediately donating $1,000 to his church. “God puts you in spots. Everything I have is from God and Jesus,” he said of his reliance on faith. From start to finish, he knew he had “Chopped” won. To prepare, he’d spent lots of time using weird ingredients and timing himself. “I was confident, but still nervous,” said Witcher, who filmed the episode in September, but was sworn to secrecy until it aired. “I think the judges respected me,” he added. The keys to his winning, he said, were “big flavors and being innovative,” plus letting his personality shine through. 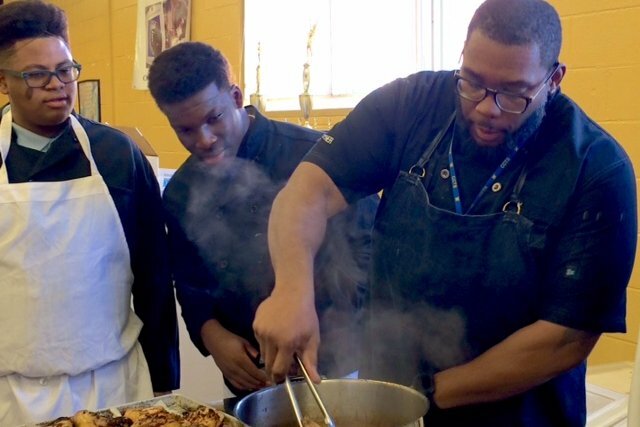 The chef is a big guy with a big personality who works full-time as a chef educator at the Camden County Technical School in Gloucester Township. He’d previously been an instructor at the Burlington County Institute of Technology, the high school where he and Sbraga met and bonded after nearly getting into a squabble over wearing the same shirt. “It was weird at first, being back as a teacher, because now my teachers were my co-workers and peers,” but he soon adapted, he said. Witcher’s resume includes chef positions at the Wyndham Hotel, the Hilton Hotel, Exceptional Taste, Victors Club, and the exclusive sections of the Wachovia Center in Philadelphia. But he feels more at home teaching. He also cooks Kosher at a Jewish summer camp. There are similarities between being an executive chef and teaching, but the key to teaching is, “knowing when to step back,” and allowing students to make mistakes. There’s also knowing when to criticize and forcing himself to slow the pace down. On Thursday, he managed to direct his students, who make the school’s faculty lunches, while simultaneously being interviewed. “Seeing them grow is incredible,” said Witcher, who went to college at Atlantic Cape Community College’s culinary school. He can usually tell which students will successfully handle the requisite 60-to-70-hour weeks with only one day off a week. They are “the ones with passion and pride, the ones who have high highs and low lows, the ones who spend extra time, who have questions, who volunteer for events where food will be served,” Witcher observed. Prospective chefs may want to consider three more things, he said. Witcher caught the cooking bug from his mother, whose kitchen in Willingboro made his South Jersey home the hangout for the neighborhood. “She made awesome food from simple things,” he said. Mix in a grandfather – he died before Witcher was born – with experience as a professional cook and it made him feel that being in a kitchen was a part of his DNA. And his daughter has made his meatloaf recipe into her signature dish. And his mom’s secret sweet potato pie recipe, once a bane to him because she would not share it, is now a joy. That recipe was recently passed down from his mother to his daughter, who baked her first rendition with her grandmother coaching, all while Witcher stayed out of the kitchen – and, he swears, his daughter’s notebook. For the televised cook-off, the first course was tomato soup, but the kicker ingredient was “pig snout.” The entrée was a braised leg of lamb with a unique exotic spice blend. Raspberries, prepared with the stinky Asian fruit paste known as durian, finished the meal. At home, Witcher said he prefers simple: braised short ribs with risotto, and either banana or bread pudding, are favorites.